Today we’re joined by my friend Jessica of HeartShapedBones. I love Jes + her blog, she’s a witch incarnate running a kickass blogging magazine and always looking effortlessly cool. I don’t remember how I found Jes’ blog, but I do remember that we became friends as we were both watching Twin Peaks at the same time! 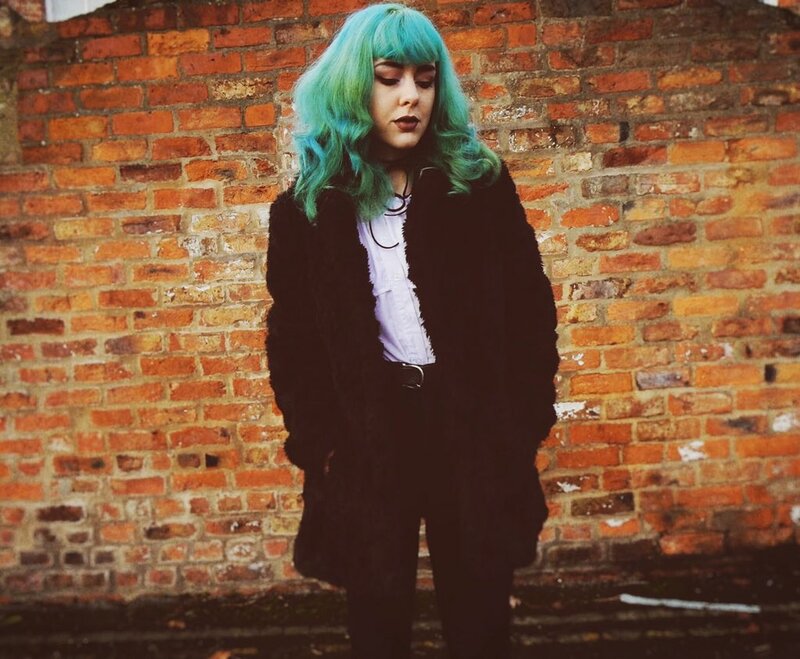 J: I blog over on http://heartshapedbones.com and also have a fashion & lifestyle youtube channel! I’m involved in a number of online projects such as The Blogging Grotto, which is a blogging magazine, and I sell my artwork, so many fingers in many pots! D:Keeping yourself busy with all of that! You manage to keep each to such a high standard too! D:Could you tell me a little bit about your offline life? J:I’m 22 and I live in Doncaster with my boyfriend, having just moved from York, which is where I studied fine art at University! I currently have a full time job at H&M, which hopefully I can pursue to manager level because I do love working for the company. I really want to pursue blogging and make it my full time job or selling my artwork, which is my end goals for now. D:That’s a great goal, I would love to be a full time blogger one day also. What an amazing job it would be! I’m glad you’re enjoying your job so much now however! J: I want it so bad if I’m honest, like I really want to make 2017 with blogging so stepping up my game! D: I believe in you! Could you tell me a bit about your creative process? Are there any parts of it you find particularly difficult? J: I feel as if I’m constantly mulling over ideas for everything, whether blogging related or when creating my artwork I always have mountains of note books lying around full of what I plan to do. I start from there and then I start to form the thing, I prep so much for filming a video so I get across everything I want, with a blog post I always take the photographs first because they’re the most important part for me. I then spend an evening writing up the posts so they’re ready to schedule for the week! Art wise, I’m in such a rut at the moment. I sketch out everything in pencil then just go for it with pen, I get inspiration from everywhere, tattoos, books, films (especially films) but I just tend to go for it with whatever thing I’m doing. D: Getting into a rut can be the worst, is that your least favourite part about creating? J: 100%, it makes me feel utterly useless like I’ve wasted my time! I think that’s how I manage to do so many things, I manage my time really well which is why it’s so upsetting when something I’ve poured my creativity into doesn’t work. D: Yeah I understand that, it’s really disappointing isn’t it? Sadly it happens from time to time. What inspired you to start creating content? And what has kept you going so long? J: I religiously read fashion blogs and watched bloggers on YouTube, and I thought from the start that I really wanted to do what they were doing! I wanted to take photos of my outfits, review things, blog about my life and create YouTube videos like the ones I loved to watch. It’s such a creative outlet for me and sharing myself with others has really allowed me to grow not only as a blogger, but a person! What keeps me going is how much blogging makes me happy, I’ve met so many amazing people, worked with brands, made friends who I speak to every day. I can spend hours writing posts and taking photos, but I never feel overwhelmed. D: I’m glad you’ve really found a place online for you, it sounds like you’re very well suited for it! D: Have you had any opportunities because of what you do? J: I’ve had some absolutely amazing opportunities that I’m still gushing over. I got to work with Propercorn last year and that was a big one for me! I love it, it’s amazing to be able to work with brands whilst using your own creativity! D: Have you got a particular moment or piece of content you’ve created that you’re proud of? J: I have a number of outfit fashion posts that I’m so proud of because of the quality, but creativity wise definitely The Blogging Grotto! It’s something I’ve wanted to do for so long now and it’s gone down a treat. Also when I finally made t-shirts with my artwork on! Such a big step in the direction I want. D: You should be so proud of The Blogging Grotto! It’s bloody brilliant! How do you find a balance between blogging/vlogging and your job and life? It’s so time consuming! J: I find it incredibly hard sometimes because it is really time consuming, instead of dedicating one day to different things, I tend to try to do so much stuff in one day and sometimes it burns me out. I’ll usually take photos in the morning, film or write a blog post, eat, edit the photos, blog some more, spend time with my boyfriend, draw on a night time. Then when I’m working it completely throws off my day and I get zero done. D: Yeah I completely get that, I bet it’s been tough with moving house too! J: oh god yeah, I haven’t posted anything on my blog in a week and that’s the first time in ages! Moving house is the worst stress possible! D: Can you list 5 influencers who have had the biggest impact on you and your content? All bloggers who not only made me want to start blogging and my YouTube channel but inspire me so much to create the content I do every day! J: eeee my Hogwarts house is Slytherin! best house haha! D: Do you have an all time favourite movie? J: Hmmmmm Oh god I realllllly wanna say Hocus Pocus, the witch inside of me is screaming say Hocus Pocus haha but it’s definitely Lost Boys! I quote it like every day. and finally, do you have any favourite artists/bands at the minute? J: My all time favourites are Nirvana and Fleetwood Mac, I listen to them everyday religiously, but I’m also loving Waterparks at the moment and I’ve gotten back into Of Monsters and Men! Huge thank you to Jes for taking part! Make sure to check out her blog and to follow her on Twitter and Instagram, and subscribe to her on YouTube. Take a look at her shop, she’s wildly talented!